This entry was posted on Monday, December 1st, 2008 at 4:51 pm	and is filed under Beth, Events. You can follow any responses to this entry through the RSS 2.0 feed. You can leave a response, or trackback from your own site. I can’t wait! Our group has had tickets for 3 months and I have had a babysitter lined up for 2 and a half! Ha! It will be wonderful to worship with everyone! I need to go get my hair highlighted! oh and Yes I was with the group who gave you the Canadian Flags and the Maritime flags. Oh how we hope you will be able to come to our part of the country. We’ll be there! I am suffering from “Beth withdrawal” since I was too old for Tuesday night Bible study! :-O Can’t wait to see how the Lord will work through you that night! I too wish that I lived closer. I would be there with bells on!! If there was a way, I’d be there! What a fantastic night you all will have- Cece, Miesta Travis, and you, our Mama Siesta! What a night! Sure wish I lived closer and could be there- But, alas, I’m not, so a Raleigh girl I’ll remain! Oh, how I would love to be there!!! I am from the Lonestar State – but I live about 1200 miles away now! I so wish I could come. I could really use the teaching and worship. And I could also go for some real Tex-Mex food right about now! You can take the girl out of Texas – but you can’t take Texas out of the girl! I’ll be praying it is a Christ-filled and joyous event! Oh poo, Wisconsin is so far away! Oh I wish I could be there!!! CeCe and Travis?!!! Goodness, Jesus is probably going to return with the praise that is going to go on in that place! I’ll be praying for you all that night! My sweet Siesta Beth, I so wish I could come!! That would so be awesome! Can’t wait to get to Heaven and be able to get together with everyone to worship our mighty King!!! I also wish you could tape it or post it or something! I love you so much, and even though it is an impossibility for me, I know you guys will praise the roof right off!!! we aren’t talking about how i can’t come to this. we’re not talking about it. or about the time i tried to covert a guy in my education class by playing him a CeCe song only to find out he was totally laughing behind my back cause he was a not only a PK, but also some like distant relative of hers. bless my heart. so we’re not talking about how i have to miss this ok, mama beth? we’re NOT talking about it. Since there’s so many of us and only one of you, it really would be easier for you to just come up this way. You could bring Keith along and I could hook him up with someone to take him bear hunting. Bible study and bear hunting – how could you refuse that?!? Oh how I would give anything to hop on a plane and attend this celebration. Know doubt ya’ll will raise the roof in the Lone Star State!!! I’ll be listening out for you here in Washington state that night and I’ll be there in spirit praising and worshiping!!!!!!!!!!! A dear friend got me a ticket, so I will be heading your way that afternoon. Yeeehawww!! Lookin’ forward to having a blast with Jesus and the gang. 1. Morgan found a back scratcher and jumbo pencil tonight (3 yrs old) and she said momma Beth Moore would love this. LOL! She also asked me if I had to go to bible study Tuesday and see Beth Moore. You are a household name. We pray for you around here and she knows you to! She prayed last night for God to pick up her toys. I about died laughing when her dad said maybe Morgan you want to pray for God to give you the strength to pick up your toys. 2. I am watching Times of Intensive Care from Life Today and WE HAVE THE SAME JACKET!! I ABOUT DIED WHEN I SAW IT! I told you…you are my fashion expert. ha ha!! Morgan wants CeCe on her MP3 player…forget wheels on the bus and etc it is CeCe, TobyMac, and Kirk Franklin!! Girls got some taste!! Would certainly do it if it weren’t on a school night! Sounds like a wonderful time. I wish I could be there! But I am going to San Antonio on the 16th and can’t squeeze two Texas trips in. Hmmm, maybe I could just make it one long trip! I know it will be great! Praying for BIG things to happen. Oh, for the day I’m living back in Texas! This siesta would love to be there with you and all the other siestas but alas, I cannot be there! Totally turning a slight shade of green…..love to all of you who will be there to worship and fellowship together! I will be there with my mom and 2 sisters! We can’t wait!!! I will be one of those faces in the audience. Coming by myself. Know that there will be a hurting heart hanging on to your every word. No pressure! 2 Sam 23:2 says that the Spirit of the LORD speaks through you and it will be His Word on your tongue. Can’t wait to hear His Voice and worship with Travis, oh my. And CeCe—that alabaster box song so brings God to me when I hear her sing it. As soon as I found out about Converge, I reserved our hotel and marked the date tickets went on sale on my calendar so I could buy them as soon as the site opened! We have a group of 8 ladies on our church leadership team coming from Louisiana, and can’t wait! We’re now counting down the hours and planning our outfits! PS. Can you recommend a couple of good Mexican restaurants close to the area? I would so love to be there. But since I have been to Jacksonville, FL, San Antonio, TX and New Orleans, LA this year, I believe all my travel without the kids points are gone. as I must say “sniff sniff”, as I am not able to come to my beloved Houston for this event, either. P.s. As of this moment, we are likely to have a “white Christmas” up here in Wis. I totally missed the Siesta Fiesta in San Antonio so I’m super excited about Converge. Fellow siestas, I’m going to be helping out at CeCe’s booth……please come by and say hi….would love to meet some cyber friends face to face!! My husband bought us tickets the day they went on sale!! Can’t wait. 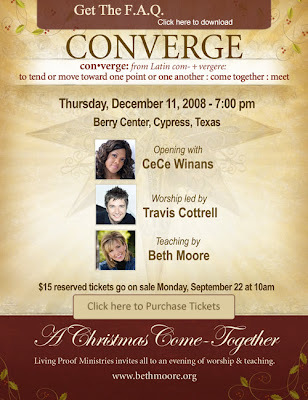 I’m taking some of the girls from the the Ministries staff and CLC office to Converge. We are so excited! Whoo-hoo! I have my tickets and cannot wait. Just another reason I’m so grateful that we moved home!! i’m comin’ siesta! can’t wait! There is no way I can make it, but for sure if I lived closer I’d be there! I know it’s gonna be great! I am in Texas, but West Texas, way too far to travel to Houston, my friend and I did talk about it though, longingly! We WILL see you in El Paso! I saw that on ya’ll’s web page! I wish I could go, but I havta work and my sis might be coming into town then. I really do like Mexican and Tex-Mex food too (sigh). I will be praying for you all though! !~:):) The Lord is gonna bless!! I like Cece Winans, her music does make me happy! :) Ya’ll have a good time for this siesta, okay? and another video recap?? Have had tickets since 9/15 and can’t wait. I purchased several along with mine as early Christmas gifts to friends who have done so much for my family and to finally have my husband be witness to a place full of Jesus and the profound energy of my mentor Miss Beth and the glorious voice and spirit of Travis as well as CeCe and the incredible worship team. We are sooooo looking forward to this especially since living in Northwest Houston, the venue is closer to my house. Whoopeeee! The Berry Center will never be the same. Praise His name!!!!! Hi Miss Beth, I know I’ve already commented, but I just have to write again. This morning in my quiet time I was studying Psalm 126 from your study, Stepping Up. At the very end where you talk about eating the seed vs. sowing the seed it felt like my heart had been pierced with a lance. I sat there stunned as I thought about how often I eat the seed. I immediately prayed that the Lord would begin to help me sow the seed rather than eat it. It was one of those moments where I instantly got it, it wasn’t going to take time to learn. So all that to say, may the Lord continue to establish your feet deeply in His Word as you study to teach us; it’s bearing fruit. Lord, pour Your Spirit out on Converge; bring new life to lifeless hearts! Just finished “A Woman’s Heart for the first time. What a blessing…can’t wait for Esther! Thanks for thinking of us Canadians!!! When I first saw this event advirtised I wanted to come so badly that I actually tried plotting a getaway with my husband where we would “accidentally” end up in Houston on the eleventh…couldn’t make it happen but still wish I could be there (Vancouver is a little far!!). For Kim from Apex…the Maritimes are now often called the Atlantic Provinces and are the group of provinces on the east coast of Canada, all bordering the Atlantic Ocean. There’s your little geography lesson for the day. Now for history….keep Canada in your prayers this week as we potentially face an historical political change. We recently (in October) re-elected a minority Conservative government, and presently the remaining three parties are attempting to topple the government and form a coalition government. Crazy times!! Please pray for wisdom and direction for all involved. Thanks so much. We are coming from LA that is Lower Arkansas and we are so excited. Three daughter in laws(one pregnant and still morning sick), me( mom in law) one sister in law, a niece, and the mom of one of the daughter in laws. Whew, all in one big surburban 8 hour drive. Can’t wait. We are all bunking in one suite with sleeping bags and air mattresses. I will be the one without hormones so I will keep everybody straight. I’ll definitely take the rain check! Wish I could be there. Have fun!!! I’m so there. Can’t wait. Been having Beth WDs with no Tuesday nights!! My heart cries out for passion, for a love that overflows! This desire has consumed me in a way that no one knows. So the hope of finding all that I desire was getting dim. I am searching for a hero I can only find in books. I want guidance and direction from someone kind and wise. A deep and lasting love; no fear of heartbreak or goodbyes. A man who’s heart is loyal and devoted to the core. Who’ll fight for me and free me from all chains that hold me back. And a total, lifelong peace and joy no circumstance can steal. And puts me on a course to please My Love at any cost. The Voice that I’d been tuning out was there to set me free! Forgive me, God, for seeking comfort anywhere but here. But You opened up my eyes and then You set my heart on fire! And as I read, I understand my joy is in the Lord! My hope is reawakened; I have found the place to start. Lord, You alone fulfill the deepest longings of my heart. You never will reject me, Lord; Your promises are true. And in my darkest storms, You are my source of radiant light. God, YOU ARE MY DESIRE, my deepest passion and delight! In the midst of exams, papers due, and financial worries…I am praying that I can still make it there from Waco, TX. God always does amazing things when I take moments like that out to worship alongside so many faithful believers and listen to the voices of one of His faithful beloved children…that’s you Beth! You encourage and uplift me in times of great challenge. Thank you God for the insight that you are already placing in her heart and mind, and for that beautiful way that she shares it with us all. As well as the amazing presences of Travis and Cece. What an amazing night it will be!! God bless all who attend, and those who can’t! Which means I have two free tickets if anyone would like them.